These are so much fun, that I just can't stop making them!!! Yesterday was the last day of school...and in typical fashion, I had GRAND plans of things to make in teacher's favourite colours, etc...Ummm...yeah. Didn't happen. Can't say as I'm surprised because it NEVER does! Anyway, these feature the same products as the ones you saw yesterday except the covers are Rich Razzleberry this time and the accent colour is Dusty Durango. Have I mentioned that I love, love, LOVE the new In Colours? 'Cause I do!!! In Colour Happy that is! I can't tell you how thrilled I am with the new in Colours! I'll be honest with you: they are WAY outside of my comfort zone - I normally am not a lover of bright colours. But these are SO yummy, you just can't help but want to play with them. 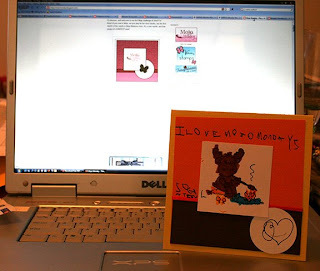 I created these a few days ago the very moment I received my box of goodies from the man in brown. How fun! 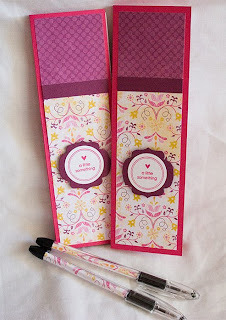 My DD is past the age where she gives gifts to her teachers, but she has one teacher that she particularly likes, so I made a little notepad and matching pen for her. The second notepad and matching pen went to our family doctor with whom we had an appointment this past Monday afternoon. What better way to get my name out there, right? 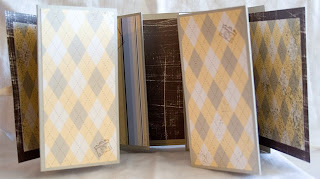 I used Melon Mambo Cardstock as the base to cover the note pads. I used a piece of Razzleberry Lemonade DSP on the front and a strip of Rich Razzleberry Cardstock to hide my seem. The sentiment was stamped in Melon Mambo (which, by the way, smells REALLY yummy!) on Whisper White Cardstock and mounted on a piece of Rich Razzleberry which was cut using the Matchbox Die. I mounted the sentiment on dimensionals. I rolled a piece of Razzleberry Lemonade to fit inside the pen to complete the customized look. Last Chance Stamps and Accessories! It's that time of year again when Stampin' UP! announces its list of stamps and accessories that will no longer be produced. The good news? The new catalog will be available July 1st with all sorts of new goodies in it! Until then, if there is a stamp set that is on this list and you simply MUST have it, let me know! I'll be placing an order in the near future and will be happy to order it for you. (please note that by SU! rules, I may only sell to customers in Canada). Thanks Caro, for making such a nice list! 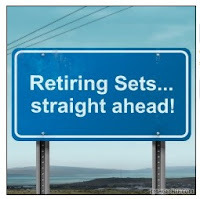 Hope you don't mind that I'm mooching it - LOL! There's quite the list of last chance accessories too! Accessories will only be available WHILE SUPPLIES LAST, so get 'em now!!! RIBBON POLY TWILL SO SAFFRON 7/8"
RIBBON GROSGRAIN PINK PIROUETTE 1 1/4"
RIBBON DOUBLE STITCHED BAJA BREEZE 1"
RIBBON GROSGRAIN STRIPED TANGERINE TANGO 5/8"
RIBBON GROSGRAIN STRIPED PINK PIROUETTE 5/8"
RIBBON GROSGRAIN STRIPED KIWI KISS 5/8"
RIBBON GROSGRAIN STRIPED RIDING HOOD RED 5/8"
RIBBON GROSGRAIN STRIPED PACIFIC POINT 5/8"
I'll try to update the accessories list as best I can as items sell out. I know a lot of US schools are already done for the year, but up here in the great white north - LOL! - we still have about 1o more actual school days. Jonathan will be going into grade 1 in the fall (how did that happen!) and so we will be bidding farewell to the bus driver that he's had everyday for the past two years. Mario (the bus driver) is going to Italy so today is his last day. He's a GREAT driver and always makes sure the kids getting off the bus point out their mom or dad before letting them go - no lost children in two years - WOOHOO!!! I always find it incredibly difficult to make gifts for men - I do much better with girly stuff of the pink and frilly variety. Thank goodness both boys have female teachers this year - PHEW!!! Since Mario is going to Italy, I thought I'd make him a little flip album to take on his trip or to record his trip when he gets home. I used the papers from a DSP pack that I've been hoarding for AGES! It's either Spring Flowers or Spring Showers...not sure which, but I do know they both came out around the same time. I think it was supposed to match Kraft cardstock, but I didn't have any of that in 12 X 12, so I used Sahara Sand. 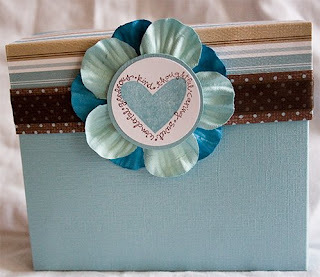 I supposed I could have modified the directions to but it would have made a TINY album if I'd used 8 1/2 X 11 Kraft. Something to ponder for another project on another day. I made the card using some leftover scraps from the album and stamped the sentiment (from All Holidays) in Whisper White Craft ink directly on the card (using my Stamp-a-ma-jig). Sushi Bowl Party - FUN!!! 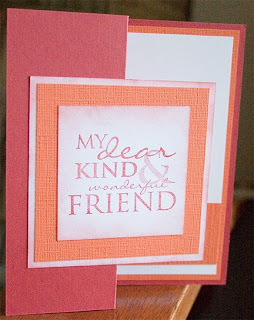 I made this card a while back and realized that I hadn't put it on my blog yet - silly me!!! I picked up this set called Sushi Bowl Party while I was in Austin at the end of March with my hubby who was on business. 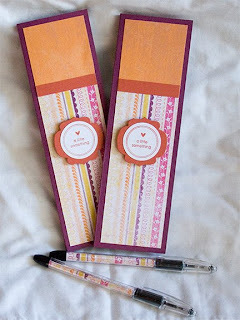 The stamp set is by Stampendous and is part of their "Perfectly Clear" line. There is SO much going on here, I don't even know where to start! 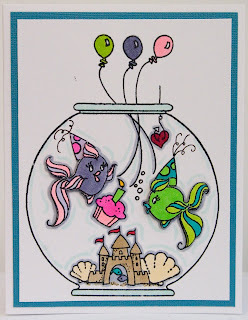 I stamped the fishbowl first and then stamped the castle. I then masked the castle and stamped the shells behind it. Being of the "go big or go home" ilk, I cut out the teeny tiny door in the castle and stamped the fishies on the inside - PHEW! The larger fish were stamped into to bowl and then stamped again on a separate piece of cardstock, coloured, cut out and mounted on dimensionals for that 3-D effect. The little hats were stamped/cut separately too and I doodled in the streamers coming from the hats. I masked the top of the bowl and stamped the balloon strings and the fish hook holding the heart so that it looked like the strings and fishing line were inside the bowl. Finally, I stamped and coloured the balloons. PHEW!!! This would make a GREAT birthday card, but I'm not quite sure to whom I should give it...maybe my niece...her birthday is coming up in a few days - YIKES! Better get that in the mail! Whew! Well...clearly whatever Mojo I thought I may have lost has come back in SPADES today! 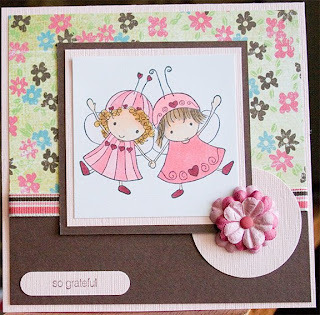 I received the BFF Huggabuggs from an image swap on SplitCoast Stampers and I think they are just adorable! I coloured them using my Copic markers (sorry! Can't remember which ones as the Huggabuggs were coloured a couple of weeks ago) and then matted them on Pink Pirouette (I am SO gonna miss these in Colours, but looking forward to playing with the new ones) and then again on Chocolate Chip. The background DP is Fancy Pants. I think the Chocolate Chip looks great with it and must order some Tempting Turquoise because I think that will work well with it too! The ribbon is American Crafts from the Valentine's collection, but hey! You can't go wrong with pink and brown, right? Been loving the Primas lately, so they are on this card too!!! The stamp in the word window is from a set called Cute Converse and inside I stamped "For You" from the All Holidays set. I'm thinking that even though this is all pink and brown, I might just give it to my DH because I am most DEFINTELY so grateful for him! He wanted me to take a picture in front of the Mojo Monday screen. Sorry about the quality...the contrast of the bright screen and the dark cards does not make for high quality pictures! 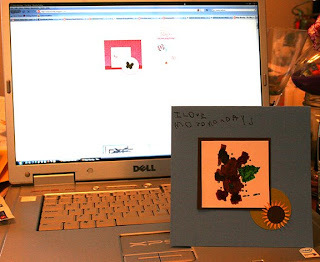 I don't know if you can see it or not, but at the top of both cards he wrote, "I love Mojo Mondays". He'd be thrilled if you left him a comment or two! Thanks! It's another Z-Fold card (not that you can tell from this pic), that is a standard A2 sized card. I scored and folded in the middle at 4 1/4" and again on one side at 2 1/8" to create the fold. I used my threading water punch to scallop the edge of the folded side and attached a piece of 3 X 5 1/2" yellow cardstock to the front (though it looks kind of peachy in this picture). Under the scalloped edge and attached directly to the card base is another piece of yellow cardstock cut to 2 X 5 1/2", though you can't see it from the angle in this photo. 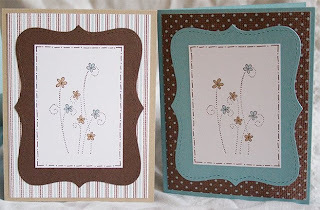 The sentiment (from Simply Said) is stamped in Chocolate Chip on Whisper White (once again using my stamp-a-majig). 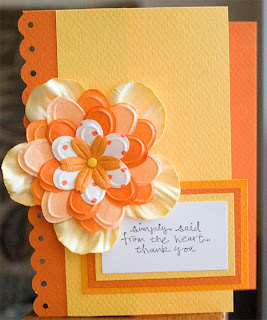 The sentiment panel starts off with a piece of 1 1/4 X 2 1/4" piece of Whisper White and increases by 1/4" incrementally with three other pieces of yellow/orange cardstock. Hope you continue to have a Stampin' Good Day! It's Secret Sister time again! 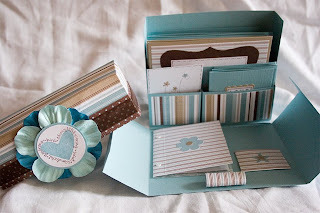 One of the blog groups that I belong too is in Secret Sister mode again - WOOHOO!!! Carmen (our wonderful hostess once again) issues challenges to us over a set period of time and we create based on the challenges. At the end of the challenges, we box up all our goodies and send them to our Secret Sister. This time around, my secret sister is...WHAT? You didn't actually think I would tell you, did you? That would spoil all the fun! Our first challenge was to try a "new to you" technique or one we didn't use very often. I chose a Z-Fold card. I don't know why I don't do it more often, because it's a great fold and has so many possibilities! I chose to go the simple route on this one, though I may still dress it up a bit (and if I do, I'll post another shot). I stamped the sentiment (from All Holidays) in Riding Hood Red on Whisper White and sponged the edges also using Riding Hood Red. The sentiment was mounted on textured Tangerine Tango and then again on Whisper White sponged with Riding Hood Red. Parisian Breeze - Oh how I love thee! And I am SO sad to see it go, but I have decided to LOVE the new in Colours even though they are out of my comfort zone. I'm going to do AMAZING things with them, just wait and see!!! 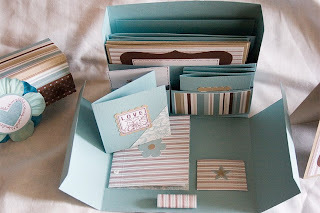 I created this box over the weekend using a template from the totally talented Jackie Topa. I've made some before and given them away as gifts and they have always been well received. I decided to use up some of my MANY Prima flowers and I think they work great with the Parisian Breeze DSP and Baja Breeze Textured Cardstock & Ink. It's a wonderful contrast to the Chocolate Chip. I stamped the Baja Breeze heart on Whisper White cardstock and then used my Stamp-a-majig to stamp the Chocolate Chip words right where I wanted them. I then used my 1 3/4" punch to punch out the image and then hand cut the circle of Baja Breeze textured cardstock behind it. I was SO sad to learn that the RSVP pens are just a little too big to fit inside the box. I was hoping to add a custom pen, but now have to see if I can find one short enough to fit the box that is customizable. The stickers you see on the little book (for addresses) and the small pocket (for postage stamps) are part of my Never Ending Simply Scrapping Kit. These fit in the large pocket at the back of the box. 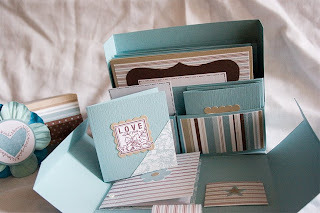 I wanted to keep them fairly simple so I could include 8 cards and envelopes in the box. I used a stamp from Simply Said (another of my faves which is also, thankfully, not retiring). I used a blender pen and my Baja Breeze ink pad to colour some of the flowers. The others were coloured using my Copic E43 (Dull Ivory) which is a match for Kraft cardstock. There are 4 Kraft cards and 4 Baja Breeze cards. This is taken from the top on a bit of an angle so you can see the pockets, etc a bit better. Now, if you read this far, you have an opportunity to win this box!!! 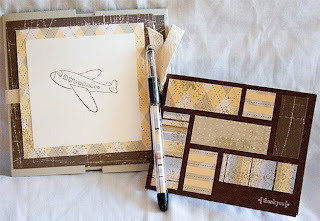 Place an order with my from Stampin' UP! before June 11th and I will enter your name in a draw to win it! 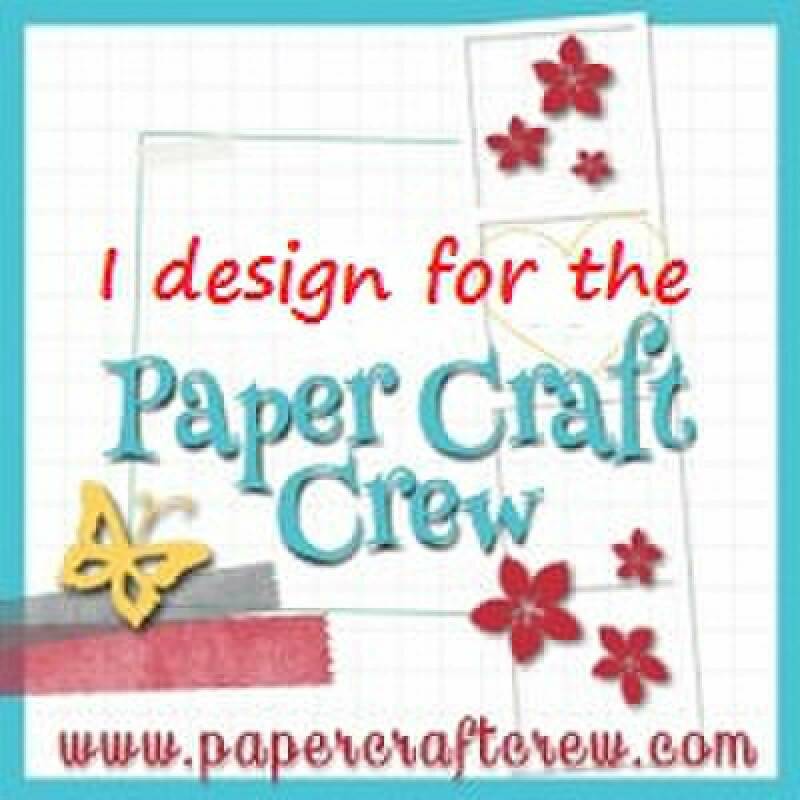 This contest is only open to Canadians since by Stampin' UP! rules I am only allowed to sell within Canadian borders.